Green Day art show (2009). Selected images. StolenSpace Gallery, London. First off in the music+art room, we offer you a university art classroom-style Compare and Contrast. 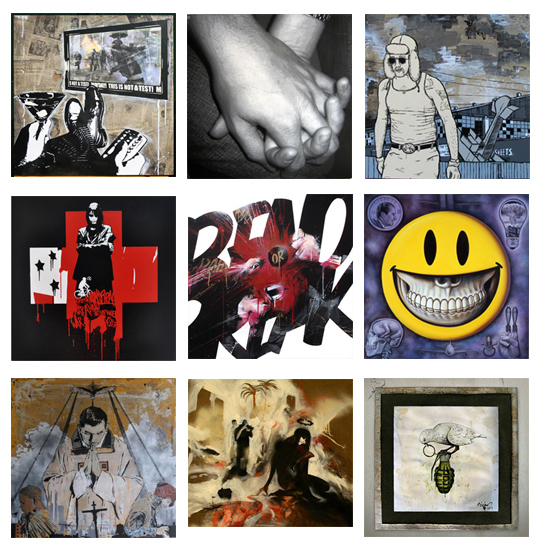 Here, we show you nine paintings made by various visual artists that reflect a specific song on the Green Day CD 21st Century Breakdown in some way. We’ve also embedded YouTube clips of the nine songs. In this project, there are 18 paintings commissioned or selected—one painting for each of 18 songs. Plus there are some portraits by the artist-curator of the show, Logan Hicks. These works will be exhibited at StolenSpace Gallery in London towards the end of October, with the opening on the day before the band’s two performances at the 02 Arena. Okay, let’s take a close look at the music+art then and see where this goes. We have three commentators and we aim to offer our thoughts about the music and art—and the combination. R.J.: early 40s in the Netherlands (too many degrees). Music influences: early B-52s and Depeche Mode, Cabaret Voltaire, Ministry, Nine Inch Nails, Marilyn Manson, Front Line Assembly, Curve. Not familiar with Green Day. Sculpture/installation, not 2-D work at all really. D.M. : early 20s in the UK, BA Fine Art, music store boyfriend, fan of early Green Day and went to one "massive gig—it was brilliant". Favorites include Bon Jovi, 30 Seconds to Mars, Rob Zombie, Black Stone Cherry and Marilyn Manson. Artist/photographer. L.A.: child of the late 60s/70s; classically trained; fully degreed but disenchanted with academia; ever more suspect of formalism; finding marvelous contrasts in the western American Land of Zion (Utah); loving Beatles, Stockhausen, Rage Against The Machine, and even the guilty pleasures of Warholian characters in pop culture. Plus we’ve added the comments of Delfina (on 20 October 2009) who runs a Green Day fan site and has a fine art background. Now at the risk of sounding like a couple of Beavises and Buttheads, we discuss nine works showing music+art 21st Century Breakdown, and choose our favorite. These are just our perspectives—please make up your own minds! Green Day art show: Broken Crow. Song of the century. Broken Crow. Prosperity, 2009. Spray paint and acrylic on masonite. 30 x 30 in. Broken Crow: "Wage endless war. Crash airplane in scrap yard photo shoot explosion. Crawl unscathed from wreckage heap. Use bloody knuckle stumps to cut stencils, make rock and roll caveman painting." D.M. : I quite like the track, it’s slow which makes a change from a lot of the album, but perhaps a little too sing-song for the lyrics. Perhaps I’m missing the irony here. The artwork, unfortunately, does little for me. I don’t personally like the stylistic nature of the foreground images, but the colours at least are successful in fitting the mood of the song—they remind me of a storm brewing. Intentional or happy accident? L.R. : Subtly deceiving and deeply ironic lyricism. The prelude tries to disguise its darker side alerting the listener to the problem which Green Day wants to explore. I find the art is a perfect match. Familiar and nostalgic, it primes the viewer to recognize the paradox and to contemplate the problem’s roots—are they ethical, moral, and spiritual? And to what extent in history? Guest reviewer Delfina: The song has a mournful quality, a prelude of ominous things to come, with the (heart)breaking voice coming from a faraway, crackling radio station. Both listener and singer are lost by the distance. The artwork’s most evocative quality for me is the gray, smeared sky, over which the plaintive voice in the air is seeking to connect. 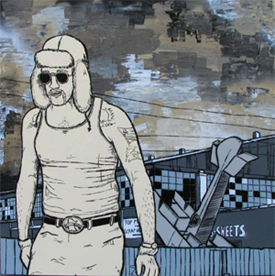 The man’s hard-luck weariness is emphasized rather than concealed by the big furry hat and dark shades, which can’t protect his exposed tattoos and soft belly. The downed plane is a bit too obvious: is the man supposed to be walking away from the wreckage of his dispiriting life? The bleak tone of the image would do it for me without that signifier.